Smarter Selling: How to grow sales by building trusted relationships was co-authored by Keith Dugdale and David Lambert based on their experience observing the techniques of the best-of-the-best sales people in professional services firms for more than 25 years. The tools and techniques in Smarter Selling form the basis of all work undertaken by The Business of Trust team. 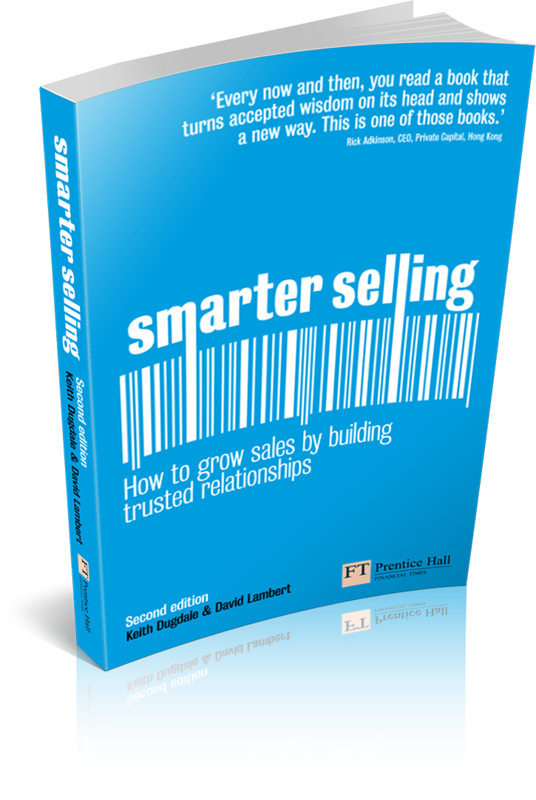 Smarter Selling shows readers the smarter way to sell – by building trusted, consultative relationships with your clients and customers. Whatever you are selling, this book will help you do it better, and feel better about doing it. By switching your focus from the hard sell to building more trust and adding more value, you will end up not just with more satisfied customers, but with more sales as well. I’m someone who didn’t think of myself as a salesperson. This book showed me how to tap the power I have within to be great at selling our innovative product, particularly to discerning professional service firms. I believe it’s made my company a lot of money. The book’s all about authenticity. Reading it I was reminded how when Britain – in a massive PR marketing campaign – declared themselves to be ‘cool’, but the public thought that was the uncoolest thing ever. Because more than ever the public is cynical and you can’t fake it. You’ll be judged on what’s really inside. And this is what Smarter Selling drives at. Get real in your relationships and that’s what your customers will judge you on. They’ll know if you’re truly there for them. I appreciated how the book presented theory and necessary mindset. And then followed with practical tools to implement the ideas. The section on ‘Value Sheets’ is particularly useful. I’ll recommend this book at it was to me. I read the first edition of this book four years ago, and have been following the advice ever since, with great success. This second edition, endorsed by the hugely-influential Charles Green (The Trusted Advisor) and Neil Rackham (SPIN selling) has been updated, and is an even more relevant package than the first. What I really like about this book is that it clearly outlines some simple behavioral tools that can easily and usefully be implemented in all business relationships — whether with colleagues and other stakeholders in your own organization, or with external clients. It even shows you how to repair damaged relationships! Perhaps the most important lesson I’ve learned from Smarter Selling is the importance of the “trusted advisor” mindset. There are several other books that describe this mindset in intellectual terms, but this book offers practical techniques to ensure you really live it and genuinely feel it. This book is for anybody who needs to have more effective, collaborative relationships at work, or who needs to turn customers into loyal clients … and wants to enjoy the process. Being a professional person, and having our own small business, I never wanted to think about myself being a sales person. This book, recommended by our accountant, really opened my eyes and gave me a positive new frame for the whole selling process. Since reading this book, I have done further research on the subject and there is no doubt that the authors are ahead of the curve on the issue of trust being the critical differentiator – this was my major takeaway from the book. The tools were very clear and really helped us get this process ingrained. I’ve spent my career (thus far) beating my chest when it comes to selling and engaging with people. I’ve had moderate success, however after reading Smarter Selling, I have come to a realisation that I have been ‘stuck in first gear’ all this time. With the simple tools provided in this book I have really turned direction in my approach to effectively engaging with clients as well as other people within our organisation. I think this is a must read for anyone who really cares about how to maximise your day to day interactions. Highly recommended.